Master the technical, communication, and critical thinking skills you need to provide compassionate, competent care in any health care setting with Lippincott's Textbook for Nursing Assistants, 4e. This comprehensive, student-friendly book is written in a conversational, easy-to read style, features a unique and fully integrated art program to help you understand key topics, and provides clear, concise coverage of nursing procedures that conform to the latest state-specific guidelines and 2012 NNAAP skill revisions. Guidelines (“What You Do/Why You Do It”) boxes provide the whys and the how-tos for carrying out key nursing assistant actions. Tell the Nurse! Notes summarize observations that you need to report to the nurse. Stop and Think! Scenarios encourage you to solve the types of complex, real world nursing situations you’ll encounter on the job. Helping Hands and a Caring Heart: Focus on Humanistic Health Care boxes encourage you to empathize with those in your care and meet patients’ and residents’ emotional and spiritual needs, as well as their physical needs. Empowering online learning tools that help you master key content, include Watch and Learn/Listen and Learn Audio and Video Clips and an interactive audio glossary that pronounces vocabulary words, defines them, and uses them in a sentence. Procedure boxes that emphasize the concepts of privacy, safety, infection control, and comfort begin with a “Why You Do It” statement, followed by concise step-by-step instructions (including “Getting Ready” and “Finishing Up” steps) to prepare you for role as a nursing assistant. Chapter-ending summary sections help you review the key concepts. What Did You Learn? multiple-choice and matching exercises similar to the questions on state certification exams allow you to evaluate your understanding. Answers are provided at the end of the book. Nursing Assistants Make A Difference! sections include first-person accounts from patients, residents, clients, or family members that focus on how a nursing assistant has had a positive impact on their lives or the lives of their loved ones, demonstrating how vital nursing assistants are to the health care team. 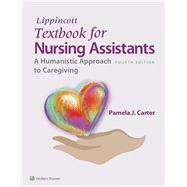 Lippincott Textbook for Nursing Assistants A Humanistic Approach to Caregiving: 5 out of 5 stars based on 1 user reviews.